Hello, hello, hello! Wow, it's been so long since I've last written. I have a lot of really good news to write about. 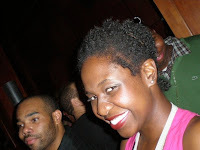 Last time I blogged, I discussed my eager frustration with my hair - the shrinkage, fairy knots, etc. WELL...thanks to my fav blog (BGLH - which has a NEW SITE, PLEASE CHECK IT OUT!!!) I have found some good detangling techniques that I have tried and officially CO-SIGN them! Also, I took a recent trip to Atlanta and saw SOOO many new natural styles, I have tons of inspiration and new ideas to try now that I'm home again. 4. Grab my essentials (raw shea butter *microwaved to make it nice and buttery*, aloe vera & avocado oil *idea swipe from BGLH via Rachel from Little Golden Lamb*, then take out twists and braid each twist section. I then let my hair dry (via sleeping with a satin cap overnight) and have seen GREAT results. I've used this method about 3 times now and can say that my hair is *slightly* more manageable when I wash it now. My twists are also more stretched using this method, and THUS, so is my twist-out. 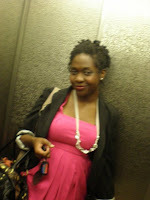 As for styling...I typically two-strand twist it the next day and wear twists Mon-Fri. I apply avo oil to the twist ends every other day. Friday night through Sunday, I rock twist-outs I apply more whipped shea butter & oil to the twist out parts. I separate the twists to fluff *idea swipe from BGLH via Andrea from Fly*. I find that rocking a twist-out for more than 3 days leads to rough ends for me, so I try to minimize the amount that I wear it out like that. 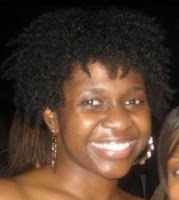 Check out pics below for some of my twist/braid out successes from this method. BTW - using my essential products, my hair feels so soft and silky and has shine - I love it!!! Note: My hair will lay down *somewhat* the day that I take out the twists/braids. However, after one-night of sleep I see a more anti-gravity look, which still works just fine for me! I had a FA-BU-LOUS weekend with my LS's!!! I love them dearly - so beautiful, so strong, and FABULOUS!!! 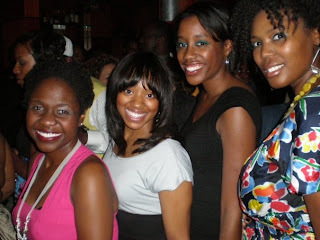 LOL...here's a pic of us partying it up at Luxe in DC. We had a great time...you can't necessarily tell what my hair looks like, but I was rocking a twist-out, which I pinned up with cute clips *they had polka dots on them* and bobby pins. Here are a couple more close-up pics of my hair. *I forgot to take some official pictures when it was fresh, but this will still give an IDEA of what it looked like. Please ignore the guys in the background...I really like this style. 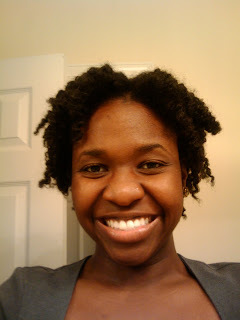 I was wearing my hair twisted in two-strands last week and rocked a twist-out this week. I'm doing pretty well with my "less detangling" theory.